[Workaround] OMS View Designer Pitfall alias Bug ? Now because I was of course myself hit by this and afraid losing my just designed dashboard I looked for a way to just open it behind the screen. And I found a workaround. And paste this new URL above. And yes you are in !!!! Now first to do is to disable the Data-flow verification feature and save the dashboard. OMS View Designer Pitfall alias Bug ? When you add a Tile you will have the feature called “Data-flow verification”. This feature will enable you to put a message on the Tile when no data records are found in the OMS system. This is a handy feature because you don’t want to show an empty dashboard…. But this could also raise an issue during design time. Because … what will happen when you have setup the “Data-flow verification” to check the past x days for any data but have made a typo or the data isn’t flowing in any more…. Yes of course the dashboard will show the message you specified but you will get more (for free) …. Now look at the tile when you add the query, it will give you a error when it hasn’t got any data back. So this will indicate you are going to have this issue…. This unsupported fix worked great for SCOM 2012 CU1/6 and SCOM 2012 R2 UR1/2. CU7 or SCOM 2012 R2 Update Rollup 3 it is officially FIXED !!! Thank you Microsoft SCOM product team for this fix !! To verify you open the stored procedure “[sdk]. [Microsoft_SystemCenter_Visualization_Library_TopNEntitiesByPerfGet]” from the DWH database. — Use existing sprocs to narrow down the perf counter instances that are valid for the contained types. Avoids duplicating that logic here. — Populate this table with the target types of the matching rules. Especially MPs Microsoft.SystemCenter.Visualization.Component.Library.mpb and Microsoft.SystemCenter.Visualization.Library.mpb because they contain the widget fix. So community keep on SCOMMING and making great dashboards!! Update! : Fixed the run issue on SCOM 2012 R2 installations in MP version V1.0.0.6 . Thanks community for pointing out to this R2 issue. This works perfect EXECPT when you have more instances of a performance value. Let’s say the table space free of table spaces, or disk C: D: ect from windows servers. But a fix for this in a SCOM CU was till now never released…. Till now…. As I mentioned before it’s in the Stored Procedure “Microsoft_SystemCenter_Visualization_Library_TopNEntitiesByPerfGet“. We have a code part that does an exact match on the instance name. If we want to show all instances it will not return any matches. See the yellow parts below. Suggestion to fix, is to use a like match. See yellow part. To change this you will need SQL Developer knowledge. And I realize that most of the operators know a lot of backend/frontend products but aren’t developers. So it could be a bit of a challenge to change this stored procedure yourself. And you go to the Widget dashboard you created and what do you see ???? Yes a working TopN Widget page. Using this task is totally unsupported. But in my opinion the negative impact is very low compared to the positive impact because this stored procedure is only used for reading data and not changing it so it wouldn’t impact the DB with incorrect data (except for some SQL performance penalty for the use of the like statement). When you reload the MP Microsoft.SystemCenter.Visualization.Library the stored procedure will be overwritten to the original version. This could happen if you implement an upcoming CU release. If the issue isn’t fixed in this release you must rerun the TASK again. 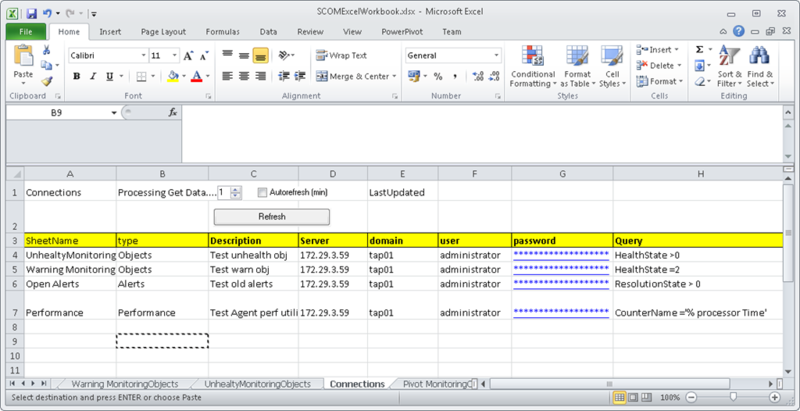 SCOM and Excel a perfect couple. 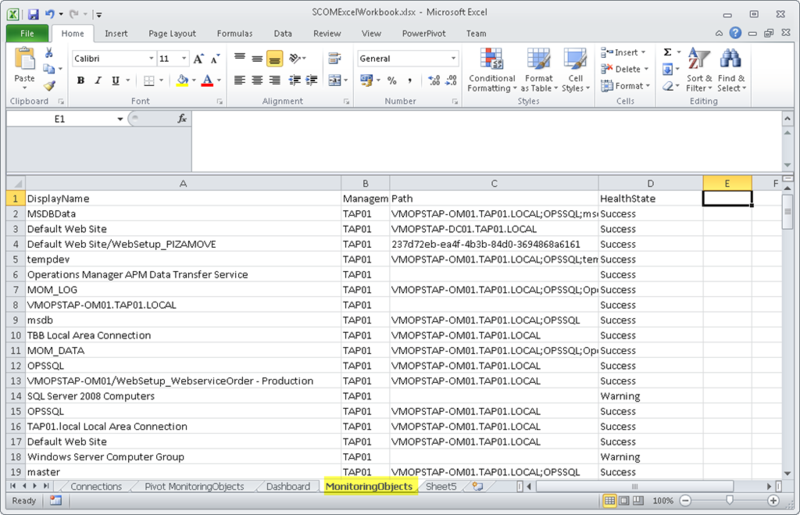 This time I will do a post on retrieving SCOM data into Excel. 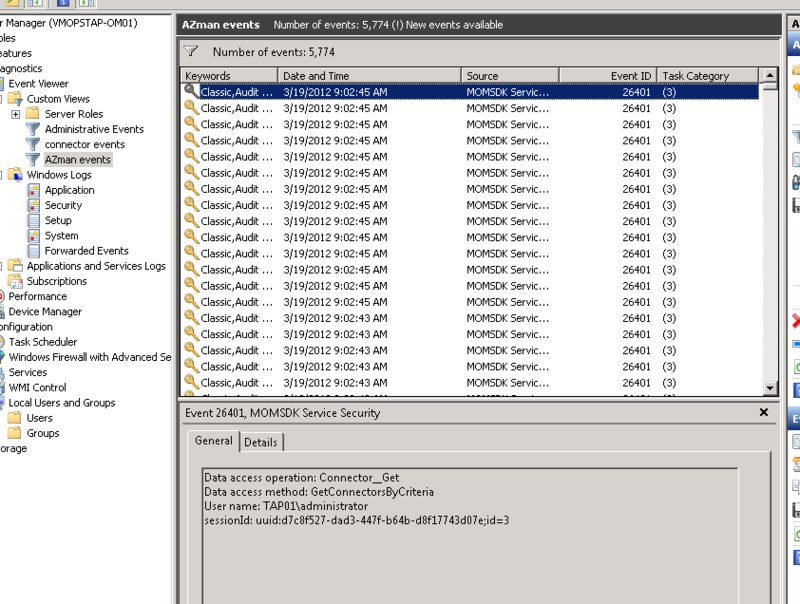 In a previous blog post series I talked about how to process SCOM data into pivot tables. See: https://michelkamp.wordpress.com/category/powerpivot/ But you had to use direct SQL query’s to get this data. So this is what I wanted to eliminate. Also I wanted to get SCOM data from more than one management group using different credentials and only over an SDK connection. So… can I make you lucky today ? I programmed a prototype in a C# EXCEL sheet that will do all the work. You will have 1 sheet that will contain all the MNG and SCOM data you want to retrieve. After you press the ‘refresh’ button all the SCOM data will be retrieved and put into a new created worksheet with the given name. You can also use the auto refresh for a , for example , every 1 minute refresh. Now you can make your pivot or graph from the data. The nice part is that you will only have to have excel and this plugin installed. NO SQL connections and NO faulty SQL query’s. Every row in this sheet contains the MNG connection and the data you want to get. This is done by using the SDK SCOM query language (http://msdn.microsoft.com/en-us/library/bb437603.aspx). In the Type column you specify the type of data you want to receive. For now you can choose : Alert , Objects , Performance. Now if you press on Refresh every row is processed the MNG group is connected and the data query is executed. The output is written into a new created sheet with the name that you typed into the SheetName column. If you go to the , for example , MonitoringObjects sheet you will see all SCOM targets with their healthstate. This is because the Query is “HealthState > 0”. Next you can use this data as input for everything you want. For example a pivot table that summaries the health of the targets. 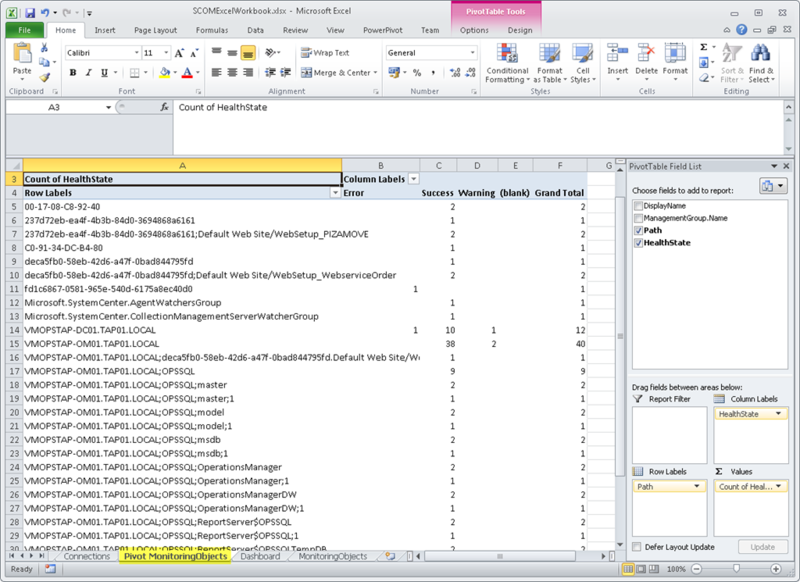 Using Excel with SCOM data this way you can create and display every output need you want. And even better what your boss want. Just give your boss a prepared sheet and let excel do the work. No “he can you give me this today “ or “can you put a other label on this table” ect.. The first nice part is that if you set the auto refresh all the pivot tables used in any sheet is updates also. 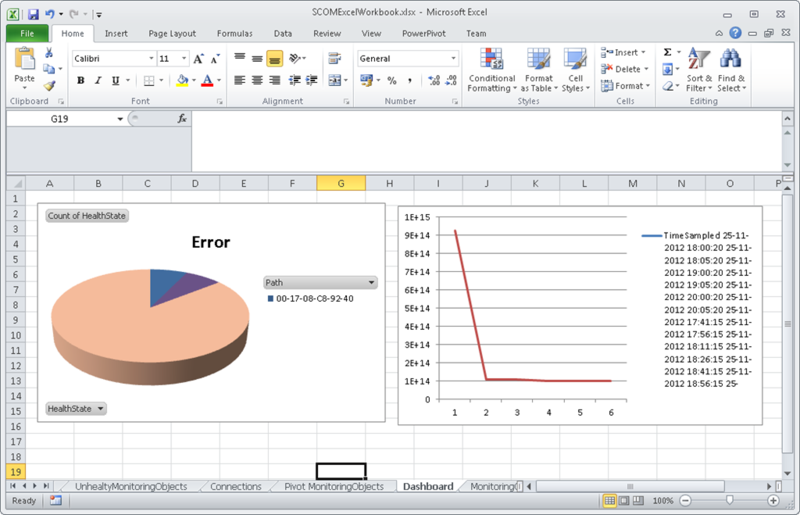 Imagine that you can create a ‘real time’ excel dashboard and put this full screen on the wall. The second nice part is that I will SHARE this sheet !! 😉 Just drop me a mail or put a note on this post and I will send it to you. Remember its still a prototype but you can customize it as wish.